Born in Puerto Jiménez de Osa en 1992, Rigoberto Pereira Rocha was surrounded by tropical nature from a very young age. When he was only three years old Rigo’s family moved from the Osa Peninsula to the village of Hatillo, near Hacienda Barú. Four years later he and his sisters María and Vanessa moved to Hacienda Barú with their mother Doña Leticia. 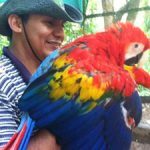 Living at the nature reserve gave him the opportunity to learn all about the flora and fauna of the tropical rainforest. Though he is one of our youngest guides, he is far from being the least experienced. It soon became apparent that Rigo had an amazing eye for spotting wildlife. Even before he had graduated from primary school in Hatillo, he was offering his wildlife spotting services to ecological tourists who came to Hacienda Barú to walk on the self-guided trails. He worked for tips. “If you don’t see any animals, you don’t have to pay me anything?” was his offer. But the people who went with Rigo always saw wildlife. Of all of his experiences in the rainforest Rigo was most impressed when he saw two male sloths fighting over a female. The fight was violent and both males emitted loud, high-pitched whistles. They were close to the ground where he could easily see everything that was going on. The female was high in the tree awaiting the outcome of the battle. Rigo realized that this was nature’s way of selecting the strongest male to mate with the female and pass his genes on to future generations.